What is SleepTalk for Children ? The early years of a child's life have always been important but are now increasingly complex for children and their parents to navigate. I work with many parents who are deeply concerned about their children and how they are managing and coping with the pressures of growing up in today's world. Research shows there is declining health and wellbeing in our young people, increasing numbers of whom are succumbing to depression and anxiety. University of Sydney researchers who looked at psycho-pharmaceutical medications prescribed for children and adolescents from 2009 to 2012 found that the number of children aged between 10 and 14 given antidepressants jumped by more than a third, while anti-psychotic medications rose by almost 50 per cent (read the full abc news report here). Such an increase in such a short time frame indicates that the need to focus on building our children's self esteem and resilience is perhaps greater than ever. SleepTalk for Children is a methodology for building your child's self esteem that is extremely simple for parents to learn and use with benefits that have often been described as miraculous. The concept was originally created by hypnotherapist and psycho-nutrition educator Joane Goulding to assist her daughter Michelle who was diagnosed with cerebral palsy and dyspraxia. The SleepTalk for Children process assisted Michelle to grow into adulthood feeling secure and loved with a positive "I'm OK" attitude which has remained with her throughout and well beyond her childhood years. Over the past thirty years the concept has been further refined and developed into a successful methodology that has helped numerous families to create empowering relationships within the home environment and given hundreds of children the most precious gift of self love and self esteem. Although orginally created to assist a child with "special needs", SleepTalk for Children is for any child so whether your child is "gifted", "normal" or in need of special help, the benefits of the SleepTalk process are appropriate and available for all children. 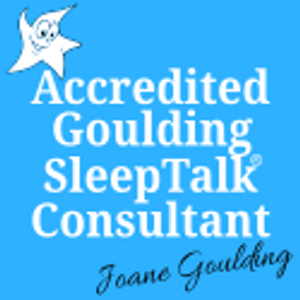 As a keen user of the methodology with my own child, I recommend the process to all families unreservedly and as a SleepTalk for Children Consultant, I would be happy to assist you in learning to use this valuable technique. What are the benefits of SleepTalk for Children ? Specific concerns that can successfully be improved using the SleepTalk for Children techniques include bedwetting; nail biting and other nervous habits; fears and anxieties; eating habits and also a number of health issues where a psychological component is present such as asthma and various skin conditions. How can I learn the SleepTalk for Children process? The SleepTalk for Children process is a beautifully simple process that takes only a few minutes of your time to use with your child each day. The process involves talking to your child during a specific stage of his or her sleep cycle which research has identified as being an optimal state for "subconscious" learning and this state of consciousness, when the conscious mind is asleep but the subconscious mind is aware, provides a unique opportunity for very specific messages to be fully accepted and believed by your child at a deeper subconscious level. Using very precise language tailored to your child's specific needs and the correct tone of voice during this optimal stage of your child's sleep cycle enables you as the parent to empower your child to overcome a wide range of issues which may be of particular concern and/or to achieve self confidence and inner strength regardless of what each day brings. This is the preferred option of many parents as it allows for detailed assessment, discussion and monitoring of your use of the techniques as well as your child's progress over a three-month period. This can be a workable alternative to the three-month programme for parents who feel they are sufficiently self-motivated to follow through with the process and feel confident in using the process and monitoring their child's progress without additional support.